The National Concrete Pavement Technology Center, Iowa Department of Transportation, and Federal Highway Administration set out to demonstrate and document the design and construction of portland cement concrete (PCC) overlays on two-lane roadways while maintaining two-way traffic. 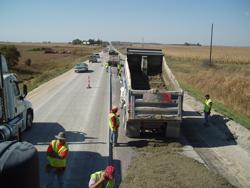 An 18.82 mile project was selected for 2011 construction in northeast Iowa on US 18 between Fredericksburg and West Union. This report documents planning, design, and construction of the project and lessons learned. The work included the addition of subdrains, full-depth patching, bridge approach replacement, and drainage structural repair and cleaning prior to overlay construction. The paving involved surface preparation by milling to grade and the placement of a 4.5 inch PCC overlay and 4 foot of widening to the existing pavement. In addition, the report makes recommendations on ways to improve the process for future concrete overlays.